Every year as part of Taste Washington weekend, the Washington Wine Commission host several education seminars to highlight the unique terroir, wines and personalities of the Washington wine industry. 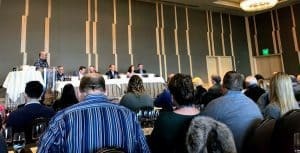 This year I participated in the Washington vs the World: Old World, New World, Our World seminar that was moderated by Doug Charles of Compass Wines. The event was presented as a blind tasting of 5 flights–each pairing a Washington wine with a counterpart from elsewhere in the world. Featuring a panel of winemakers including Casey McClellan of Seven Hills Winery, Jeff Lindsay-Thorsen of WT Vintners, Keith Johnson of Sleight of Hand and Anna Schafer Cohen of àMaurice Cellars as well as Damon Huard of Passing Time Winery and Sean Sullivan of Wine Enthusiast and The Washington Wine Report, the one and half hour event was a terrific opportunity to learn insights from the panel while honing your blind tasting skills with some world class wines. Below are my notes from each of the flights followed by the reveal of what the wines were. Wine 1: Opaque ruby with more red than blue hues. Medium-minus intensity nose–floral roses with red berries. Some oak spice. On the palate–red cherry and currant. High acidity, medium-plus tannins. Little skeletal and thin. Short finish but the floral notes come back and seem promising. Feels like a young Cab that needs some time to flesh out. No minerality so likely New World. Cool climate Washington–Yakima/Walla Walla? Wine 2: Very opaque purple. Much darker than #1. Little hazy so likely unfiltered. Medium-minus intensity–dark fruit but also a noticeable green note. Vanilla. The sediment from wine #2. There was no sign of age so clearly this wine wasn’t filtered. On the palate, the noticeable oak vanilla comes to the forefront but the green leafy notes are also there. Dark fruits but still not very defined, especially with the oak. Medium-plus acidity and high tannins that have a chalky grittiness to them. Some clove spice from the oak. Likely a Cab like wine #1 and it feels like a New World Napa with dark fruit and all the oak but the green notes are throwing me off. Napa Mountain AVAs? 2014 Walla Walla? Wine 3: Opaque with more red than blue hues. Medium intensity nose. Chocolate covered cherries and spice. On the palate, chocolate cover cherries still with blue floral notes (Cab Franc?) and a mix of oak baking spice and Asian cooking spice. A lot of layers to evolve. High acidity–very juicy cherries. Medium-plus tannins, very velvet. Some pencil graphite minerality on the long finish (Cab Franc x2?) Kinda Old Worldish but the chocolate covered cherries seem New World or a very modern Right Bank Bordeaux? Very lovely. Wine 4: Opaque ruby with a little fuchsia hues. Pretty similar color depth to #3, just slightly different shades. Medium intensity nose with some floral and perfume nose. Vanilla blossoms. Smells like a Macy department store. Some blue fruits. On the palate, the blue fruits–plums and blueberries–carry through and has noticeable oak. Medium-plus acidity and high grippy tannins. Seems very Cab-like with that big structure. No minerality and really short finish. Like wine #1 this seems a bit skeletal and young but I don’t think this one is as promising as #1. Washington BDX blend? Wine 5: Opaque ruby with noticeable blue hues. High intensity nose. Smokey tobacco and meatiness but also an earthy forest element. It smells like you’re hiking through the forest to get to a brisket BBQ. On the palate, lots of dark fruit–black currant, black raspberry–but lots of smokey, meatiness too. Some leather. High acidity, high tannins. Big wine! Long finish with cigar notes. Taste like a Left Bank Bordeaux and Cote Rotie had a baby. Fantastic wine but I can’t think of a WA producer doing this. Wine 6: Opaque ruby with noticeable blue hues. A tad darker than #5. Medium-plus intensity nose. Dark fruits. Chocolate covered acai berries. Lovely blue floral notes. On the palate, rich black fruits–black plums, black currants. Noticeable oak vanilla. Juicy medium-plus acidity and medium-plus tannins. Very well balanced. Long finish. Taste like a high-end Napa so high-end WA? Both of these are outstanding. Wine 7: Opaque ruby with some blue hues. High intensity nose with leather and smoked meat. More intense than Wine #5! A little green olive tapenade on toasted bread. Grilled rosemary skews. Floral violets. Roasted coffee. Lots and lots of layers! On the palate, blackberries and bacon. The roasted coffee notes come through as well as most of the bouquet. Medium-plus acidity and medium-plus tannins. Little back end heat. Long finish. Very Northern Rhone-like. Really delicious wine that I want more time with. Wine 8: Very opaque purple. Much darker than #7. Medium-intensity nose. Almost shy compare to #7. Black fruits. Citrus-lime zest? (WA Syrah?) Medium acidity and medium tannins. High pH. Little rocky minerality on moderate finish. Warm climate New World. Seems like a Red Mountain Syrah. Reminds me a little of the Betz La Cote Rousse. Wine 9: Clear ruby with red hues. First wine that I can see through. Medium-plus intensity nose. Roasted chicken herbs–thyme and sage. Some blue floral notes. On the palate, a mix of red and dark fruits–cherries and berries–with the herbal and floral notes. High acidity. Medium-plus tannins. Little minerality on the moderate finish. Seems like a cool climate New World or Old World Rhone. Wine 10: Clear pale ruby. Lighter than #9 but darker than a Pinot noir. High intensity aromatics with earthy notes and red fruits. Some bacon fat smokiness. On the palate, all red fruits–cherries and tart cranberries. The smokey bacon fat also comes through (Syrah?). High acidity and medium-plus tannins but way more biting. Not as well balanced as #9 and coming across as more thin and skeletal. Short finish. Seems young. Wine 2: 2013 Joseph Phelps Vineyards Insignia Napa Valley (Wine Searcher Ave $213) Update: Sean Sullivan informed me that this was poured from a magnum which likely highlighted how young tasting and underwhelming this wine was. 2015 Sleight of Hand Cellars Psychedelic Syrah Stoney Vine Vineyard — WOW! This wine was so funky and character driven that I can still memorably taste it over 4 days later. I’m usually not that blown away by Sleight of Hand wines–finding them well made but often jammy and fading quickly–and while I don’t think this wine is necessarily built for the cellar, it certainly built to deliver loads of pleasure and layers of complexity over the next few years. The Sleight of Hand Psychedelic Syrah from the Stoney Vine Vineyard was my Wine of the Event. 2012 Château Lynch Bages Pauillac — I don’t know what kind of decanting this wine saw before the event but this wine was tasting exceptional for a young Pauillac–more so for a young Lynch Bages! I suspect it was opened earlier in the morning with the somm team pouring the glasses at least an hour before the event started–which is still a relatively brief amount of time for a top shelf Bordeaux. Update: I learned from Nick Davis of Medium Plus and the somm team at the seminar that the 2012 Lynch Bages was opened only 40 minutes before the event and poured 20 minutes prior to the tasting beginning. That only adds to how impressive the wine was showing. The 2012 vintage in Bordeaux is not getting a lot of attention being bookend between the stellar 2009/10 and 2015/16 vintages. Like 2014, you hear Bordeaux lovers note that 2012 is much better than 2011 and 2013 but that almost seems like damning with faint praise. It’s clear that there is a lot of great value to be had in this vintage–compare the Wine Searcher Ave for 2010 Lynch Bages ($190) & 2015 ($142) to the $114 average for 2012–and if it is starting to deliver pleasure at a little over 5 years of age then it’s worth investing in as a “cellar defender” to enjoy while waiting for your 2009/10 and 2015/16 wines to age. 2014 Duckhorn Vineyards Merlot Napa Valley — I was not expecting this result. During the blind tasting I was very intrigued by this wine and ultimately pegged it as a Right Bank Bordeaux made in a style along the veins of Valandraud, Fleur Cardinale, Monbousquet or Canon-la-Gaffelière. Never would have pegged it as a Napa Merlot! In hindsight the chocolate covered cherries should have been my clue but they were so well balanced by the acidity and minerality that it didn’t come across as “Napa sweet”. Well done Duckhorn! An honorable mention goes to the 2015 Passing Time Horse Heaven Hills Cabernet Sauvignon. I was very impressed with how how Napa-like it has become. I was already a fan of the winery and tried this 2015 as a barrel sample at last year’s release party where its potential was evident. Still, I wasn’t expecting it to be this good, this quickly. It was rather unfair to compare the Passing Time to the 2012 Lynch Bages which was so different and so fantastic in its own right. A better pairing would have been with the Joseph Phelps Insignia or any other high end Napa like Silver Oak, Caymus, Frank Family, Cakebread, etc and I have no doubt that the Passing Time would have came out on top for most tasters. Admittedly I was a tad concerned finding myself consistently liking the first wine in each tasting flight but I can’t think of any systematic reason that would lead to that result. The wines were all poured in advance and I cleared my palate with crackers and water between each so I have to chalk it all up to coincidence. For the most part, the varietal character and identity of each flight stood out and I was fairly accurate in identifying them. 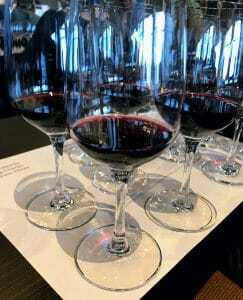 The main outlier was the Merlot flight (#2) featuring the Duckhorn and Seven Hills Merlots. The Duckhorn was tripping some of my Cab Franc notes while the Seven Hills was exceptionally Cabernet Sauvignon-like so that led me to deduce Right Bank Bordeaux blend which was wrong but at least in the ballpark. The more difficult task was trying to nail down the region and which was the Washington example versus the World example. Here I felt like I only solidly hit 2 of the 5 flights (Flight #1 and Flight #3–Cab and Cab-dominant blends) but that was mostly just by 50/50 luck–especially in Flight #1. 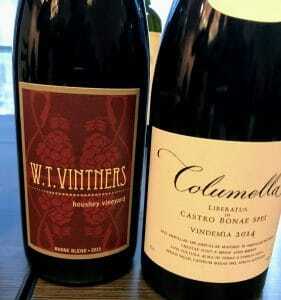 The WT Vintners Rhone blend from Boushey Vineyards in the Yakima Valley is a tough wine to pin down in blind tasting because of its mix of Old/New World characteristics. 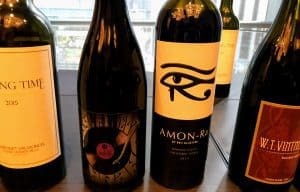 I was often tripped up by how “Old Worldish” many of the Washington wines were–especially the Sleight of Hand Cellars Psychedelic Syrah from the Stoney Vine Vineyard in the Rocks District. In hindsight, this should have screamed “ROCKS!” to me much sooner. While technically Oregon, this sub-AVA of Walla Walla produces some of the most complex and interesting Syrahs being made in Washington. I commented from the audience that putting this Syrah in a blind tasting is a little evil because of how Old World and Cote Rotie-ish it is. 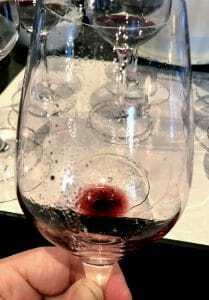 Another thing that makes Washington a bit difficult to peg down is how frequently “cool climate notes” like red fruit, juicy medium-plus acidity, bright floral perfumes and subtle herbal notes appear in wines that are actually grown in rather warm climates (especially compared to Old World regions like Bordeaux). This is largely because of the significant diurnal temperature variation in Eastern Washington that can swing as much as 40℉ from the high heat of the daytime to cool low temperatures of night. This allows Washington grapes to get fully ripe and develop some of those dark fruit notes but, especially in cooler areas like Boushey and Red Willow Vineyard in Yakima and parts of Walla Walla, also maintain ample acidity and some of those cool climate characteristics. From a blind tasting perspective, I need to solidify in my mind that getting a wine with that mix of warm/cool climate characteristics should be a tip off that I’m dealing with a Washington wine. Hell yeah. 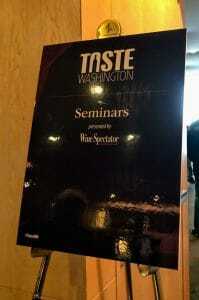 While I wasn’t impressed at all with attending The New Vintage, I will certainly make an effort to attend future seminars at Taste Washington. 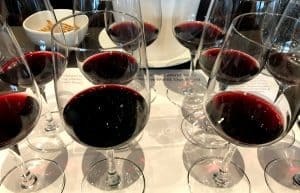 At $85 a ticket, this was one of the more expensive seminars with others being as low as $45 a ticket, but the experience (and tasting over $800 worth of wine) delivers more than enough value to merit the cost. A lot of great wine to taste through. The only slight criticism is the rush between tasting each wine and getting the panel and audience to start commenting on them. Especially being a blind tasting, I wanted more than just a minute or two to critically taste and evaluate the wine before I start hearing other people’s comments that may sway my assessment. Granted, I’m sure I’m in the minority here as I could tell that for many other participants in the audience, tasting the wines and being able to ask questions of the panel was a bigger draw than getting a chance to sharpen their blind tasting skills. When you have 10 wines being presented over 90 minutes–and allotting time for questions about vineyards, grape varieties, winemaking style, etc–something got to give so I understand why the tasting time got the short shrift. Still, it was an exceedingly worthwhile experience that I highly recommend for Washington wine lovers and wine geeks alike. Tagged àMaurice Cellars, Amon-Ra, Anna Shafer, Barossa Valley, Bordeaux blend, Bordeaux vintages, Bordeaux wine, Boushey Vineyard, Cabernet Franc, Cabernet Sauvignon, Cakebread, Canon-La-Gaffelière, Casey McClellan, Caymus, Cellar defender, Ch. Valandraud, Columbia Valley, Compass Wines, Côte-Rôtie, Damon Huard, Doug Charles, Duckhorn, Fleur-Cardinale, Frank Family, Glaetzer Wines, Horse Heaven Hills, Insignia, Jeff Lindsay-Thorsen, Joseph Phelps Vineyards, Keith Johnson, Lynch-Bages, Medium Plus, Merlot, Monbousquet, Napa Valley, Nick Davis, Passing Time Winery, Pauillac, Pinot noir, Red Willow Vineyard, Rhone blend, Sadie Family, Sean Sullivan, Seven Hills Winery, Silver Oak, Sleight of Hand, South African wine, Stoney Vine Vineyard, Syrah, Taste Washington, The New Vintage, The Rocks District, Walla Walla, Washington Wine Commission, Washington Wine Report, Wine Enthusiast, Wine Spectator, WT Vintners, Yakima Valley.